This morning, Los Angeles-based Lottay (www.lottay.com) launched its online gifting site, announced its funding by DFJ Frontier, and also the appointment of former Evite GM Harry Lin as CEO. We spoke with Harry yesterday about the company. Harry, thanks for the interview. What's the idea behind Lottay? Harry Lin: The idea behind Lottay, is to make gift giving online as satisfying as it is in the real world. There are lots of trends in virtual gifts, but most of them are around spending real money to send something fake to someone, which is not very satisfying, in our opinion. In the real world, the trend is gift cards, which is giving a version of plastic money as a gift. Our idea was, if you could send someone a gift as conveniently, and as fun as a virtual gift, but with real cash attached to it, that would be a fantastic experience. As you probably know, PayPal just opened up their platform to outside developers, and we took a look at that and the opportunity it presented, and build something based on the PayPal API. PayPal is the world's safest and most secure cash transaction mechanism, and we thought if we could build something on top of that it would deliver the delight, fun, and convenience of a virtual gift, but have real money attached to it. Lottay's gift are virtual things--anything you want--attached to real money, in a PayPal account. For example, I could send you $25 towards a Wii Nunchuck, with a cute picture labeled from me, and an actual $25. How did Lottay start, and tell us about your Series A? 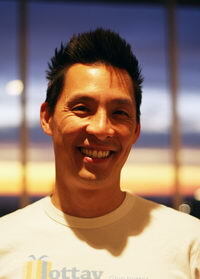 Harry Lin: Lottay originated before me, I've just been barely two months as CEO, from an entrepreneur, Andy Elliott. Elliott came up wit the idea in 2008, seeing the trends I just explained to you. He took it to angel investors, two of them of some note--Steve Blank, CEO of Epiphany, who also runs a great blog at SteveBlank.com, and Klaus Schauser, founder of Citrix Online. Klaus and Steve thought Andy was a great entrepreneur and it was a good idea, and seeded it. Andy did the typical startup thing--he kept his full time job, as did the developers, and worked their full time jobs and worked nights and weekends to get a prototype running. They went into full product phase over the summer, and unveiled the post-prototype, alpha, pre-beta, whatever you want to call it, at TechCrunch50. At the same time, they were looking for an executive who had a lot of company-relevant experience, and experience in the startup world, and experience scaling and building a business. That's where I came along. I had been talking to DFJ Frontier, about funding my startup prior to this. DFJ Frontier called me, saying they saw a fantastic company which they wanted to invest in a Series A, and they said they could really use you. They were very specific about you--not someone like you, but you. How come? It was because of my Evite experience. I had been GM of Evite for just under two years. Maybe at first blush it's not obvious how Lottay is similar to Evite. We were all lucky in that I was looking for my next gig, because I couldn't get financing for my own startup. Timing sometimes does, and sometimes doesn't work, but in this case, it worked out perfectly, and DFJ funded their Series A. It sounds like part of the reason they did get funding was you were able to join? Harry Lin: It's part and parcel of things. It was, if we get our Series A, we can get Harry, and if we can get Harry, we can get a Series A. You mention the parallels to Evite, what are those? Harry Lin: That's a very interesting question, about what is the "Evite"-ness of Lottay? The answer is, Evite is essentially a utilitarian service. It's got a very simple function--helping you organize party invitations and RSVPs online. Period. If you want to look at it, it's a series of functional checklists. It's like email, no doubt about it--this is not a lot of technology, rocket science, or atom splitting. But, Evite has an incredibly local user base. In November and December, they had something like 20 million parties created on Evite. Not only is that user base incredibly loyal, it's naturally viral. We spent a couple of thousand dollars a month in marketing to just keep buying Evite and Evite.com as keywords, and otherwise there was no ads and marketing. The reason why, was because although it's a utilitarian service, it spoke to a core emotional need that the organizer of the party had. It spoke to it in such a way that no other alternative could. The virtality of it, is that because the party organizer had such an experience emotionally in using the Evite service, and guests also saw that it was a great service, the next time people threw a party, they would use it. There is a natural viral coefficient very much at work. Lottay believes the same thing, that although it's a utilitarian service--it allows you to send gifts from one person to another--when you give a gift, it's nothing but emotional. At its core, gift giving and receiving of a gift is a highly emotional transaction. It's fraught with all sorts of issues, obligations, questions, and frustrations. The way Lottay works, it makes it easy to give a gift in a couple of keystrokes, but it's more satisfying. Instead of guessing at what gift they'd like, you can give cash, the best gift of all. It's also not like throwing a $50 bill into a greeting card or envelope, which is considered crass and thoughtless. When you send a Lottay gift, such as that Wii Nunchuck, you give exactly what you wanted. Even better, they don't have to use that $25 you get via PayPal to buy them. It's also great to give money to someone who needs it. You don't have to say you're helping them pay their car note, you can tell them you're giving them money to buy new skis, but you both know you're really helping them pay their car note. Lottay gifts are really a utilitarian service, it speaks to emotional transactions, and it's very positive and engaging. And, like Evite, if the receiver has never gotten a Lottay gift, it's pretty cool. Do people have to already be on PayPal to receive a gift? Harry Lin: To get the money, yes. If they are, they just have a link that gives them the very happy notice that they have $25 in their PayPal account. If they do not, they get a page saying that so-and-so wants to give you $25, just go to this page and create your PayPal account so that the money can be sent over. It's a PayPay-to-PayPal transaction, so the giver and receiver have to have PayPal accounts. So, is this launched and fully usable tomorrow? Harry Lin: Frankly, it's up right now, though we haven't made any noise yet--at least, version 1.0 is. Version 1.5 is queued up to maybe be released in three or four weeks. What's the business model here--do you take a cut of the gifts? Harry Lin: That sounds logical, but it's incorrect. Lottay does not levee a fee on top of the transaction. People hate fees when you do that, they hate it when they are charged for taking money from an ATM, for Ticketmaster when it charges a fee. We won't get adoption if we charge a fee. Our revenue model is actually affiliate ecommerce. If we send you $25 for a Wii Nunchuck, and you open the gift and see the page, it would make a lot of sense and actually be seen as a value add to consumers, to see a couple of links to the best prices for a Wii Nunchuck. You can click in, and the affiliate gives us something if there is a transaction. That's the main model that we have, but it's not quite launched, as we're researching the best affiliates to use. The second, secondary revenue stream is targeted advertising on pages. It's all of the pages, not just the gift, so it can be during creation of a gift. We've also got a wishlist function, where you can say you want a pair of Wii Nunchucks, a trip to Paris, a ski vacation, new wheels for your Prius--you can see if people will donate and give money towards it. There, advertising makes a lot of sense, but it is only a secondary stream.